Back in December of 2016, the Russell 2000 (RUT) hit a high of 1392, and from there it began its valiant journey to where it now sits -- more than six long months later -- about 12 points lower. To call this year a "sideways grind" is an understatement. The trouble with patterns like this is that the more complex they become, the more options for resolution open up. And the more options open up, the harder it becomes to figure out which is the "real" option. There appear to be three waves into the high at 1425, and while that means it's probably a corrective b-wave high and thus likely to be bested at some point, it also means we have certain expectations for resolution of that pattern in the form of a decline. 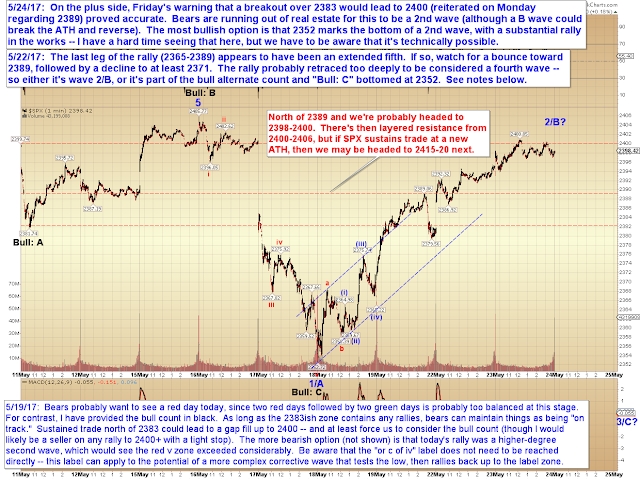 Specifically, we would normally expect an impulsive c-wave decline, which breaks the low that began the b-wave (1335). That hasn't happened yet. But before we balance all our baskets on one egg, we have to realize that this is where things become difficult due to the preceding chop -- because there's no law that says RUT can't form an even more complex wave BEFORE that anticipated impulsive c-wave manifests. In other words, it could even rally up to break 1425, then drop back down to 1335 -- or, and this is where it gets really fun (sarcasm), it could form several such waves, strung together over another few months, before we get resolution. 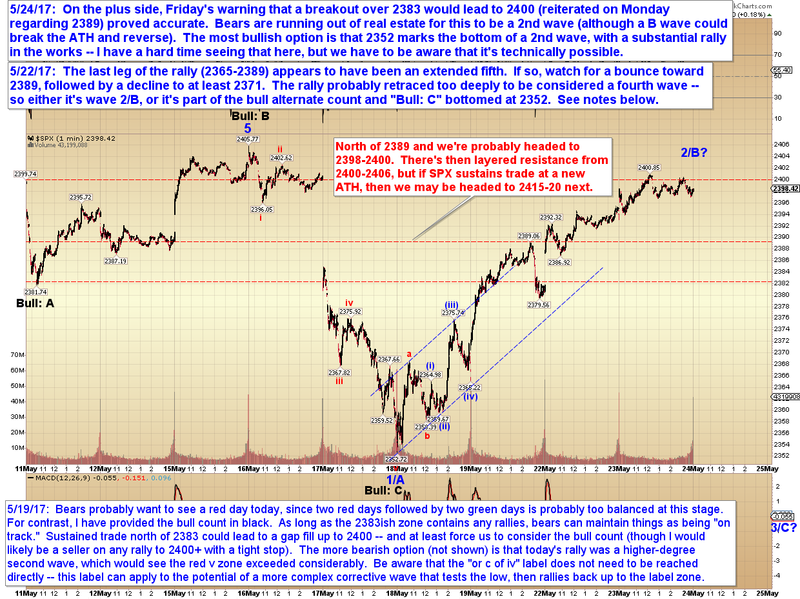 Yesterday, SPX made good on Friday's call that a sustained break above 2383 would lead to 2400. 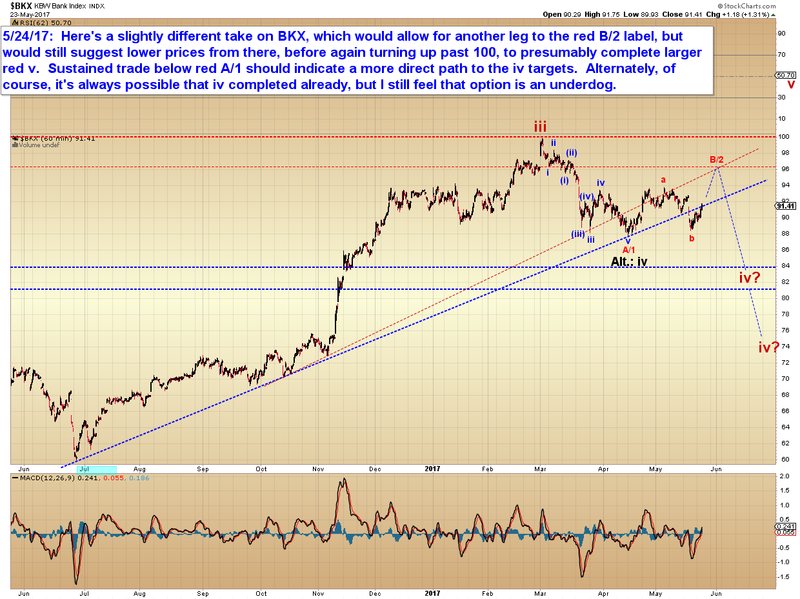 Now it's do or die time for bears, at least as far as a potential second wave goes. 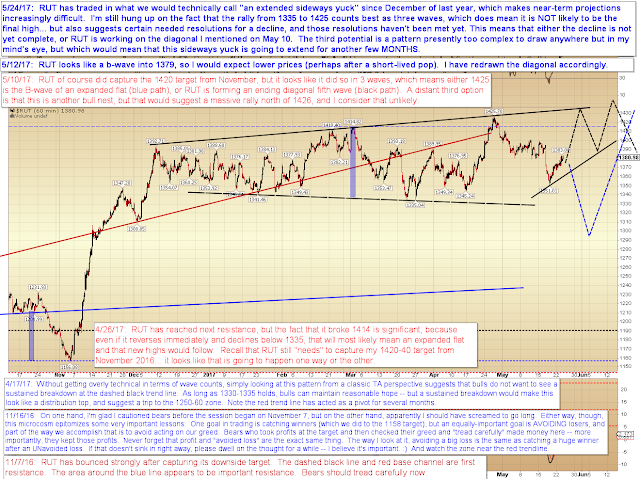 Much like RUT, SPX has many options here for continued head-fakes and sideways yuck. We do at least have to realize that from a technical standpoint, a sustained breakout over the ATH could be a third wave headed significantly higher -- so at least be aware that's a technical possibility in the event the rally continues past the ATH. And if you're a bear, then protect yourself accordingly. If the ATH breaks, then remember that you do not HAVE to take on risk, especially if you're uncertain what's unfolding -- cash is a position too. 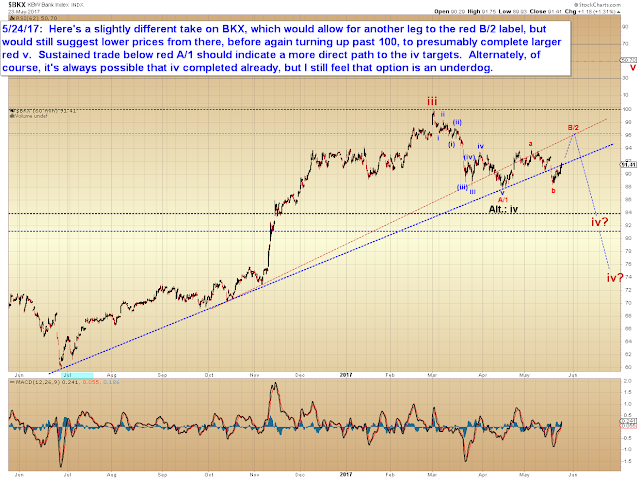 In conclusion, if bears want to keep the second wave option alive, then they need to make a stand directly. This rally is not outside the realm of technical possibility for a bear wave, so all hope is not yet lost, and at least the obvious stop level for shorts is reasonably close. The garbage end of the deal is that a breakout over the ATH won't guarantee a rally, due to B-wave potential, but it does open up the possibility of a strong rally, so that would make a breakout hard to trade, at least until there is a small impulsive decline to indicate a stop zone. 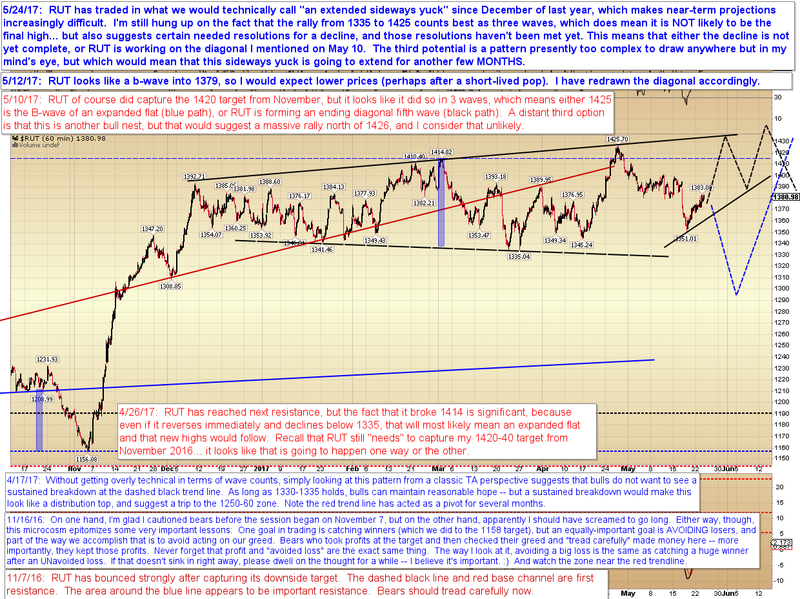 In the meantime, of course, bears still have the shot of stopping the rally here. Trade safe.